The Rockford Recycled Outdoor Dining Chair compliments the personality of traditional teak design with performance and durability. The sturdy construction of this collection is ideal for gardens, patios, as well as commercial applications. Get out of your living room and enjoy family and friends for some summer fun without sacrificing comfort. 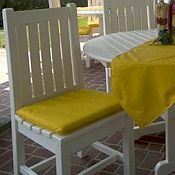 The Rockford Recycled Outdoor Furniture Collection is sure to add a personalized touch to your outdoor environment. The Rockford All-Weather Dining Chair is available in 6 Traditional Colors. Sold in Pairs. POLYWOOD® brand synthetic dimensional lumber is formed from High Density Polyethylene (HDPE), UV-inhibited pigment systems, foaming compounds, and selected process additives. The HDPE primary raw material is derived from post-consumer bottle waste, such as milk and detergent bottles or other HDPE post industrial material. This material is cleaned by a decontamination process to a high purity level, which removes contaminants such as food residue, paper, and adhesives. It is then compounded into a rigid board stock material; with the resulting finished product containing over 90% recycled plastic by weight. Because HDPE products are made with a single, purified polymer, they are manufactured to exacting, reproducible specifications. They have exceptional resistance to corrosive substances, oil and fuels, insects, fungi, salt spray, and other environmental stresses. They do not absorb moisture; therefore, they will not rot, splinter, or crack; HDPE products have excellent weathering resistance. These products require no water proofing, painting, staining, or similar maintenance when used in many exterior applications. 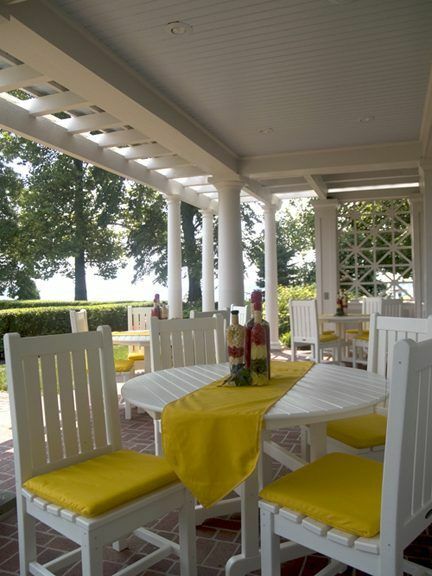 Poly-Wood, Inc. designs and manufactures timeless classic outdoor furniture. What sets this product apart is the famous recycled milk jug lumber. POLYWOOD® brand synthetic dimensional lumber is formed from High Density Polyethylene (HDPE); which is impervious to all types of weather conditions including rain, snow, salt water, sun and ice. The characteristics of this durable material are both pleasant to the eyes and touch. Poly-Wood, Inc. unites its synthetic dimensional lumber with stainless steel hardware producing long lasting performance furnishings. Availability: Usually ships in about 2-3 weeks.